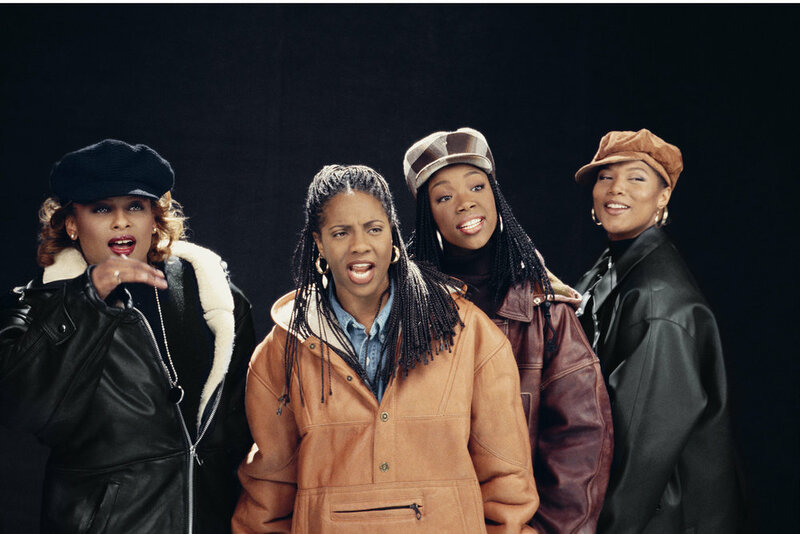 L to R: YoYo, MC Lyte, Brandy and Queen Latifah in 1994. Photo by Lisa Leone. MC Lyte, real name Lana Moorer, was born in Brooklyn in 1970. Coming of age during the period that saw hip hop spread throughout New York City, Lyte landed a record deal when her family friend Nat Robinson - father of sibling rap duo Audio Two - signed a deal with Atlantic Records on the condition she be granted a solo LP. The resulting album, 1988's Lyte As A Rock, was released on Robinson's First Priority Music imprint, on which Audio Two had released their well-received debut, What More Can I Say?, a year earlier. Five of the tracks on her ten-track LP were produced by Audio Two, whom Lyte called "her brothers" - the trio were childhood friends. These two collaborators were so artistically indispensable that they're pictured on the album art, a tactic which may have also cloaked Lyte's femininity in the eyes of the uninitiated. Though the exact release date is mired in speculation, Billboard claims that the album peaked at #50 on the week of July 9, a date at odds with Wikipedia's dubious September 13 listing. Lyte's debut album is a watershed moment in hip hop history. The first full-length released by a solo female emcee, Lyte As A Rock was a critical and commercial success that helped pave the way for essential '90s emcees such as Queen Latifah, Lil' Kim, Missy Elliot and Lauryn Hill. It found Lyte admonishing her exes with the same unforgiving vitriol as the male emcees of the day, undeniably contending with the more acclaimed and established names of the golden era. Whilst Lyte's legend would grow throughout the '90s, it was her trailblazing 1988 debut that changed hip hop forever. "Lyte vs. Vanna Whyte" introduces the emcee as a little indecisive: more a skit than a track, Lyte geeks out over production equipment before spotting a dress she likes, at which point her indecision drives her to call the whole thing off and take back the money. The album opener is produced by Alliance, a three-man outfit that also handles production on track seven, "Lyte Thee MC." One member of the trio, The King Of Chill, also produced both "I Am Woman" and "Paper Thin." The opening track contains a slowed and scratched sample of the distinctive descending horn riff from Frankie Valli's theme to the 1978 movie musical, Grease. It's the first of two Valli samples on the record, with his 1962 hit "Big Girls Don't Cry" appearing on the closing track. The track was the first hip hop tune to sample the famous theme, though it soon reappeared in De La Soul's "A Roller Skating Jam Named Saturdays." As is the case with virtually any golden era hip hop track containing scratching, "Lyte vs. Vanna Whyte" samples the distorted vocals from the close of Beside's rendition of "Change The Beat." The effects-laden vocal proved conducive to interesting scratching tones, a fact that led to it becoming one of the most sampled tracks of all time. The sample appears at 1:44. Perhaps the most immediately recognisable song on the album, "Lyte As A Rock" is the first of five tracks on the album produced by NYC hip hop duo Audio Two. That group released just two albums in their seven-year career, though they worked extensively producing for Lyte on her first four projects. The drums throughout "Lyte As A Rock" are taken from Tommy Roe's "Sweet Pea," the title track to his 1966 LP. Roe was a bubblegum pop artist who experienced the bulk of his success throughout the '60s. Though well over 70 years old, Roe only announced his retirement in 2017, five years after the release of his final album, Devil's Soul Pile. The titular refrain - the chopped and screwed "as a rock" - is lifted from Ashford & Simpson's 1984 hit, "Solid." On that track, the pair declare that their love is as "solid as a rock." The pair are best remembered for writing classics such as "Ain't No Mountain High Enough" and "I'm Every Woman." The duo re-recorded the song as "Solid (As Barack)" in 2009, an earnest reenactment of an SNL bit aired four months prior. "I Am Woman" is produced by enigmatic artist The King Of Chill, who is one-third of production outfit Alliance. Alliance are credited on Lyte As A Rock tracks "Lyte vs. Vanna Whyte" and "Lyte thee MC." As the title suggests, the track features an interpolation of Helen Reddy's classic feminist anthem, "I Am Woman." The track reached #1 on the Billboard 100 in December 1972, 19 months after the original version of the song was included on her debut album. The version that topped the charts was rerecorded for the 1972 Stand Up And Be Counted OST. "MC Lyte Likes Swingin'" is the densest tracks in terms of samples: it incorporates five seperate direct samples from '60s and '70s funk tracks. The track is produced by Prince Paul, a legendary '90s artist noted for his work with De La Soul and membership in influential groups Stetsasonic and Gravediggaz. "MC Lyte Likes Swingin'" opens with a sample of Funk, Inc.'s 1971 album opener, "Kool Is Back." The track was included on their self-titled debut, and has since become a staple of sampling culture, thanks in no small part to the drum break. It's appeared on tracks by JAY-Z, Jeru The Damaja, Beastie Boys, Public Enemy and Slick Rick. Though "Kool Is Back" is often sampled for its drums, Prince Paul takes his percussion from The Cecil Holmes Soulful Sounds' "2001." The track, included on the group's 1973 LP, The Black Motion Picture Experience, is a funky rendition of Wagner's "Also Sprach Zarathustra," famed for its inclusion in Stanley Kubrick's 2001: A Space Odyssey. Prince Paul incorporates a sample from a cover of Sly and the Family Stone's "Sing A Simple Song." The cover is by Filipino funk band Please, who recorded just four albums in their two-decade career. "Sing A Simple Song" was included on their self-titled 1975 debut. The single-note vocals can be heard at the opening of the hook, rapidly fading as MC Lyte raps the refrain. The wailing horns that loop throughout the refrain are courtesy of James Brown, the most sampled man in hip hop. Brown seems to have a monopoly on shrieking horns, which were heavily sampled throughout another 1988 classic, Public Enemy's It Takes A Nation of Millions To Hold Us Back. These particularly horns are taken from "Don't Tell It," a track from Brown's 1976 LP, Bodyheat. The seven-track album was Brown's forty-seventh. Prince Paul samples yet another of Brown's distinctive horn parts, this time borrowing from the opening of "Cold Sweat." The early Brown cut was credited to James Brown and The Famous Flames, the group in which he initially made his name. The track was included on the 1967 album of the same name. The sample first appears at 2:17, running throughout the remainder of the track. A curious 'vicarious' diss track, "10% Dis" was Audio Two's way of rebuking a female emcee. Unwilling to engage with Antoinette, a rapper whose Hurby Azor-produced debut bore a striking resemblance to Audio Two's "Top Billin'," the duo produced this track as a response. The title refers to her full capabilities: even though the track is vicious, it's only 10% of Lyte's devastating potential. The track was issued as the second single in early 1988. "10% Dis" opens with a sample of Roxanne Shanté's debut single, "Roxanne's Revenge," released just four years prior. That track, which utilised the beat from U.T.F.O. 's "Roxanne, Roxanne," was produced by Cold Chillin' Records producer Marley Marl. It started one of the most prolific hip hop feuds in history, which turned in anywhere between 30 and 100 answer records Shanté was the subject of an acclaimed 2017 film. The drums on "10% Dis," which enter at 0:12, are taken from The Honey Drippers' "Impeach The President." The track was released in 1972, the same year that President Richard Nixon decisively won a second term. Interestingly, by 1973, evidence was stacking up against Nixon in connection to the infamous Watergate scandal, which would culminate in his resignation in mid-'74. At 0:18, producers Audio Two sample multiple elements from the opening of James Brown's "Super Bad." The original track was released as a three-part single in in 1970, the year that brought classic Brown cuts such as "Funky Drummer" and "Get Up, Get Into It, Get Involved." The sample - which is substantially slowed on "10% Dis" - has also appeared in tracks by Kool Moe Dee, MC Hammer and De La Soul. Audio Two sample themselves at 0:28, though it's hardly vanity for vanity's sake. The duo's "Top Billin'" opens with a classic hip hop drum fill, one which has helped the track get sampled almost 300 times since its 1987 release. The drum fill has appeared in tracks by 2Pac, Quasimoto, Jeru the Damaja and Salt-N-Pepa. The second track produced by The King of Chill is the only single from Lyte's debut album to receive an accompanying music video. The track is an important piece of the album's mythology: it finds Lyte admonishing her unfaithful lovers with a relentless style that's comparable to her male counterparts. Whilst this doesn't come as a surprise in the current times, 1988 was different. Women - whilst active in hip hop from its inception - were often considered as lesser emcees than their more successful male counterparts. MC Lyte's debut did much to dispel this notion, and has since been called a watershed moment in rap feminism. The drums that enter at 0:47 on "Paper Thin" are taken from the open of Al Green's "I'm Glad You're Mine." This track was included on Green's 1972 LP, I'm Still In Love With You, which featured soul classic "Love and Happiness." The oft-sampled drum introduction has been featured in tracks by Eric B. & Rakim, Notorious B.I.G. and Massive Attack. The track features a sample of Prince's "17 Days" at 0:48, which was recorded as the b-side to his 1984 hit single, "When Doves Cry." The distinctive horn hits that begin at 0:55 are taken from the start of Earth, Wind & Fire's "Shining Star." The group's first major hit, it was released in January 1975 as the first single from their sixth LP, That's the Way of the World. The album acted as the soundtrack to the 1975 Sig Shore film of the same name. As is obvious, Lyte interpolates the classic hook from Ray Charles' 1961 single, "Hit The Road Jack." The interpolated vocals are actually courtesy of The Raelettes singer Margie Hendrix, who acted as defacto head of the largely Charles-supporting vocal outfit. The pair had a child together, but suffered from personal problems, and Hendrix was ultimately fired from The Raelettes in 1964. She died in 1978 aged 33, likely of a drug overdose. "Lyte Thee MC" is the second and final track produced by production trio Alliance. You may have noticed that the title is grammatically incorrect: "thee" is not an old English term for "the," but instead means "you." A bizarrely popular reference in hip hop, Lyte interpolates a long running cereal commercial. At 1:39, Lyte raps "sorry, silly rabbits, Trix are for kids," a reference to the Trix Cereal commercials which feature a scheming, cereal-crazed rabbit. The rabbit has been plotting on Trix Cereal since 1954, succeeding only a handful of times. The advertisement was also sampled in 1988 tracks Public Enemy's "Don't Believe The Hype" and Eric B. & Rakim's "Microphone Fiend." "I Cram to Understand U (Sam)"
On "I Cram To Understand U (Sam)," released in 1987 as her debut single, Lyte reminisces about a man she met at a roller disco back in 1981. Sam, the subject of Lyte's affection, is an idiotic yet opportunistic gold digger, and so she must "cram to understand" his bizarre thought process. It opens with one of Lyte's funniest, most succinct rhymes: "I used to be in love with this guy named Sam / I don't know why, cause he had the head like that of a clam." The final three tracks on the record are produced by Audio Two. At 1:05, Lyte interpolates the titular phrase from Frances Langford's "I'm In The Mood For Love," released in 1935. It would become her signature song, one she took on the road during her well-documented WWII troop entertainment tours. The track was written by prolific composer Jimmy McHugh and veteran lyricist Dorothy Fields, and has since been covered many times. "Kickin' 4 Brooklyn" is an ode to both Lyte's hometown and her own lyrical prowess. It's the only track on the album without any identified samples, and seeing as it's been a good three decades since the track was released, it's unlikely that any will be uncovered in the future. The King Of Chill samples this track on Lyte's "Cha Cha Cha," the opening cut on her sophomore album, 1989's Eyes On This. The track was assembled in the years before formal sample clearance practices, and as Lyte recalls in Brian Coleman's Check The Technique, "it came down to whether we’d pull [the album] off the shelves or give the people what they were asking for [in the lawsuit]." When Lyte and Audio Two were sued for their use of Valli's hit, they elected to pay the requested amount. The frenetic percussion is an interpolation of Trouble Funk's 1982 track, "Drop The Bomb." The funk album was released on Sugar Hill records, an important early hip hop distributor, and continued to help popularise the go-go subgenre. The track has been sampled in tracks by hip hop outfits such as Beastie Boys, Brand Nubian and Public Enemy. Lyte As A Rock closes as it opened: with a Frankie Valli sample. This time, the slowed and pitched-down sample is taken from "Big Girls Don't Cry," the 1962 hit by Valli and his famous outfit, The Four Seasons. The track was originally included on their debut album, the economically names Sherry & 11 Others. "Sherry," the group's debut single, had been released earlier the same year. MC Lyte would go on to release a series of similarly acclaimed albums, including 1989's Eyes On This, 1991's Act Like You Know and 1993's Ain't No Other. In 1994, she would open Brandy's famous "I Wanna Be Down (Remix)," a seminal posse cut which also featured powerhouse female emcees Yo-Yo and Queen Latifah. Reflecting on the fondly remembered joint, Brandy would say that it "meant the world to [her.]" Lyte's career continued throughout the '90s, coming to a close with 2003's Da Undaground Heat, Vol. 1, which featured esteemed collaborators such as Janet Jackson, Jamie Foxx and Biz Markie. She returned after a long hiatus with 2015's Legend, her eighth studio album. In the interim, she had DJ'd at Michael Jordan's wedding, written a self-help book and donated some of her early paraphernalia to a hip hop exhibit at the Smithsonian. Outside of music, Lyte founded a philanthropic organisation called Hip Hop Sisters which offers both social and financial support for ethnically diverse youth. The organisation also provides the MC Lyte Scholarship, which provides college grants to three students per year. Lyte is perhaps the earliest female hip hop star: following on from acts such as Roxanne and Roxanne, Lyte pushed an industry bent on limiting females to singles into the future. Whilst this would have been the case irrespective of the album's quality, Lyte As A Rock remains a bona-fide hip hop classic on merit alone.